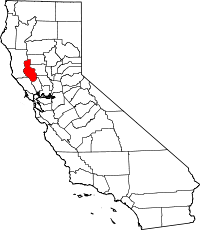 Lake County is a county located in the north central portion of the U.S. state of California. As of the 2010 census, the population was 64,665. The county seat is Lakeport. The county takes its name from Clear Lake, the dominant geographic feature in the county and the largest natural lake wholly within California (Lake Tahoe is partially in Nevada; the Salton Sea was formed by flooding). Lake County forms the Clearlake, CA Micropolitan Statistical Area. It is directly north of the San Francisco Bay Area. Lake County is part of California's Wine Country, which also includes Napa, Sonoma and Mendocino counties. It includes five American Viticultural Areas and over 35 wineries. ✪ Lots of wonderful things to do in Lake County, California! A re-emergence of Lake County's wine industry began in the 1960s when a few growers rediscovered the area's grape-growing potential and began planting vineyards. Several Lake County American Viticultural Areas, such as High Valley AVA and Red Hills Lake County AVA, have been recognized as having distinct character. The area has increased vineyard acreage from fewer than 100 acres in 1965 to more than 9,455 acres of vineyard in 2015 (a 7.6 percent increase over 2014). Lake County's grape prices, at $1,634 per ton overall, also reached an all-time high in 2015. In 2014, Lake County surpassed Mendocino County in price paid per ton of grapes in the North Coast premium market. According to the U.S. Census Bureau, the county has a total area of 1,329 square miles (3,440 km2), of which 1,256 square miles (3,250 km2) is land and 73 square miles (190 km2) (5.5%) is water. Two main watercourses drain the county: Cache Creek, which is the outlet of Clear Lake; and Putah Creek. Both of these flow to the Sacramento River. The main streams which flow into Clear Lake are Forbes Creek, Scotts Creek, Middle Creek and Kelsey Creek. At the extreme north of the county Lake Pillsbury and the Van Arsdale Reservoir dam the Eel River, providing water and power to Ukiah in Mendocino County. Clear Lake is believed to be the oldest warmwater lake in North America, due to a geological fluke. The lake sits on a huge block of stone which slowly tilts in the northern direction at the same rate as the lake fills in with sediment, thus keeping the water at roughly the same depth. The geology of the county is chaotic, being based on Franciscan Assemblage hills. Numerous small faults are present in the south end of the lake as well as many old volcanoes, the largest being Cobb Mountain. The geologic history of the county shows events of great violence, such as the eruption of Mount Konocti and Mount St. Helena and the collapse of Cow Mountain, which created the hills around the county seat of Lakeport. Blue Lakes, Lake Pillsbury, and Indian Valley Reservoir are the county's other major bodies of water. Lake County has habitats for a variety of species of concern including the uncommon herb, Legenere limosa, the rare Eryngium constancei, and the tule elk. Waterfowl, bear, and other wildlife abound in the Clear Lake basin. In 2015 President Barack Obama created the Berryessa Snow Mountain National Monument, incorporating these and other areas. Greene Bartlett discovered Bartlett hot springs in 1870. The springs were developed into a resort and by 1900 included a mineral water bottling plant. The resort burned down in 1934. Harbin Hot Springs was developed by settlers in the 1860s. Unfortunately, Harbin burned to the ground in the Valley Fire of 2015. Saratoga Springs Resort was opened by J. J. Liebert in 1873 with several cabins, and within two decades had room for 350 guests. Witter Springs Resort opened in 1873 with a hotel and guest cottages. Lake County has a mediterranean climate with hot summer daytime temperatures in its lower elevations. Nighttime temperatures remain cool year-round, somewhat moderating average temperatures and relieving the summer heat. The 2010 United States Census reported that Lake County had a population of 64,665. The racial makeup of Lake County was 52,033 (80.5%) White, 1,232 (1.9%) African American, 2,049 (3.2%) Native American, 724 (1.1%) Asian, 108 (0.2%) Pacific Islander, 5,455 (8.4%) from other races, and 3,064 (4.7%) from two or more races. Hispanic or Latino of any race were 11,088 persons (17.1%). Within Lake County are two incorporated cities, the county seat of Lakeport and Clearlake, the largest city, and the communities of Kelseyville, Blue Lakes, Clearlake Oaks, Clearlake Park, Cobb, Finley, Glenhaven, Hidden Valley Lake, Clearlake Riviera, Loch Lomond, Lower Lake, Lucerne, Middletown, Nice, Spring Valley, Upper Lake, Whispering Pines, and Witter Springs. In its early history, Lake County leaned Democratic in Presidential and congressional elections. It supported every Democratic Presidential candidate between 1864 and 1916 except Alton B. Parker in his 1904 landslide defeat. Nonetheless, between 1920 and 1984 Lake County tended towards being Republican and was won by just four Democratic nominees – Franklin D. Roosevelt in 1932 and 1936, Lyndon B. Johnson in 1964 and Jimmy Carter in 1976. Ronald Reagan in 1984 remains the last Republican to win a majority in the county, which has reverted to leaning Democratic. Lake County is split between California’s 3rd and 5th congressional districts, represented by John Garamendi (D–Walnut Grove) and Mike Thompson (D–St. Helena), respectively. In the state legislature, Lake is part of the 4th Assembly district and the 2nd Senate district. There are also several numbered county routes in Lake County. Lake Transit serves all areas around Clear Lake. Local routes serve Lakeport, Clearlake and Lower Lake. Connections are also provided to St. Helena (in Napa County) and Ukiah (in Mendocino County). Some routes operate on weekdays only; no service is provided on Sundays and observed public holidays. Lampson Field is the county's public airport. There are also several private airstrips located throughout the county. In 1888 the Vaca Valley and Clear Lake Railroad reached Rumsey, but the planned line to Clear Lake was never built. The Clear Lake Railroad started work on a line from Hopland to Lakeport: "In November 1911 first ground was broken for the Hopland-Clear Lake railroad to Hopland. Mrs Harriet Lee Hammond, wife of the president of the road started construction. ... There were six miles of track out of Hopland ...", but this was also abandoned. The population ranking of the following table is based on the 2010 census of Lake County. ^ "Lake County". Geographic Names Information System. United States Geological Survey. ^ "Snow Mountain". Peakbagger.com. Archived from the original on May 2, 2015. Retrieved April 9, 2015. ^ a b c "State & County QuickFacts". United States Census Bureau. Archived from the original on August 3, 2011. Retrieved April 4, 2016. ^ "Find a County". National Association of Counties. Archived from the original on 2011-05-31. Retrieved 2011-06-07. ^ "Clear Lake Is Unique". Official Website of the County of Lake. County of Lake. 2013-09-13. Archived from the original on 2015-10-06. Retrieved 2015-10-09. ^ "Lake County, California". Genealogy Trails. 2006. Retrieved 2015-10-09. ^ California Secretary of State (1911). California Blue Book. p. 655. ^ a b "Lake County's crop value surges past $100 million, setting new record". 2016-06-23. Archived from the original on 2016-06-24. Retrieved 2016-07-02. ^ "Lake County wine industry is ready for takeoff". 2016-05-15. Archived from the original on 2016-06-21. Retrieved 2016-07-02. ^ a b "Lake County's air rated cleanest in the nation". 2015-04-30. Archived from the original on 2016-08-16. Retrieved 2016-07-02. ^ "How healthy is the air you breathe?". lung.org. Archived from the original on 12 January 2018. Retrieved 26 March 2018. ^ "2010 Census Gazetteer Files". United States Census Bureau. August 22, 2012. Archived from the original on September 25, 2015. Retrieved September 26, 2015. ^ "LAKE COUNTY HISTORY". Archived from the original on August 31, 2013. Retrieved September 8, 2012. ^ a b "Lake County History Timeline". Archived from the original on February 22, 2013. Retrieved September 8, 2012. ^ "CLEARLAKE 4 SE, CALIFORNIA - Climate Summary". www.wrcc.dri.edu. Archived from the original on 25 May 2017. Retrieved 26 March 2018. ^ a b c d e f g h i j k l m n o p q U.S. Census Bureau. American Community Survey, 2011 American Community Survey 5-Year Estimates, Table B02001. American FactFinder Archived 2013-09-11 at the Wayback Machine. Retrieved 2013-10-26. ^ a b U.S. Census Bureau. American Community Survey, 2011 American Community Survey 5-Year Estimates, Table B03003. American FactFinder Archived 2013-09-11 at the Wayback Machine. Retrieved 2013-10-26. ^ a b U.S. Census Bureau. American Community Survey, 2011 American Community Survey 5-Year Estimates, Table B19301. American FactFinder Archived 2013-09-11 at the Wayback Machine. Retrieved 2013-10-21. ^ a b U.S. Census Bureau. American Community Survey, 2011 American Community Survey 5-Year Estimates, Table B19013. American FactFinder Archived 2013-09-11 at the Wayback Machine. Retrieved 2013-10-21. ^ a b U.S. Census Bureau. American Community Survey, 2011 American Community Survey 5-Year Estimates, Table B19113. American FactFinder Archived 2013-09-11 at the Wayback Machine. Retrieved 2013-10-21. ^ a b U.S. Census Bureau. American Community Survey, 2011 American Community Survey 5-Year Estimates. American FactFinder Archived 2013-09-11 at the Wayback Machine. Retrieved 2013-10-21. ^ U.S. Census Bureau. American Community Survey, 2011 American Community Survey 5-Year Estimates, Table B01003. American FactFinder Archived 2013-09-11 at the Wayback Machine. Retrieved 2013-10-21. ^ "U.S. Decennial Census". United States Census Bureau. Archived from the original on May 12, 2015. Retrieved September 26, 2015. ^ "Historical Census Browser". University of Virginia Library. Archived from the original on August 16, 2012. Retrieved September 26, 2015. ^ Forstall, Richard L., ed. (March 27, 1995). "Population of Counties by Decennial Census: 1900 to 1990". United States Census Bureau. Archived from the original on September 24, 2015. Retrieved September 26, 2015. ^ "Census 2000 PHC-T-4. Ranking Tables for Counties: 1990 and 2000" (PDF). United States Census Bureau. April 2, 2001. Archived (PDF) from the original on December 18, 2014. Retrieved September 26, 2015. ^ Bureau, U.S. Census. "American FactFinder - Results". factfinder2.census.gov. Retrieved 26 March 2018. ^ Leip, David. "Dave Leip's Atlas of U.S. Presidential Elections". uselectionatlas.org. Archived from the original on 4 June 2011. Retrieved 26 March 2018. ^ California Secretary of State: “Statement of Vote for November 4, 2008, General Election” Archived October 18, 2012, at the Wayback Machine, page 62. ^ a b c United States Department of Justice, Federal Bureau of Investigation. Crime in the United States, 2012, Table 8 (California) Archived 2016-06-28 at the Wayback Machine. Retrieved 2013-11-14. ^ "California Agricultural Resource Directory 2010 –2011" (PDF). Mother Jones. Archived (PDF) from the original on 8 March 2014. Retrieved 1 March 2014. ^ "California Agricultural Statistics Review 2013 –2014" (PDF). Archived (PDF) from the original on 5 September 2015. Retrieved 22 September 2015. ^ "Agricultural Statistics Review, 2014-2015" (PDF). California Department of Food and Agriculture. Archived (PDF) from the original on 20 December 2016. Retrieved 8 December 2016. ^ "Routes & Schedules". laketransit.org. Archived from the original on 27 March 2018. Retrieved 26 March 2018. ^ "General Information". laketransit.org. Archived from the original on 27 March 2018. Retrieved 26 March 2018. ^ "Glimpses of the past". Cloverdale Reveille. 1 August 1984. Retrieved 28 February 2014. ^ "CLEAR LAKE RAILROAD TO BEGIN WORK SOON". San Francisco Call. 30 September 1911. Archived from the original on 6 March 2014. Retrieved 28 February 2014. ^ Aurelius O. Carpenter And Percy H. Millberry, (Transcribed by Peggy Hooper) (1914). History of Mendocino and Lake Counties, California With Biographical Sketches. Historic Record Company, Los Angeles, California. Archived from the original on 2014-11-17. ^ Staff, Website Services & Coordination. "US Census Bureau 2010 Census Interactive Population Map". www.census.gov. Archived from the original on 29 April 2018. Retrieved 26 March 2018.